I have always wanted to know what the 60’s song ‘Lily the Pink’ was about. Written by Liverpudlian band The Scaffold, the song was Christmas number one in December 1968 and stayed there for four weeks. The song was apparently based on the folk song “The Ballad Of Lydia Pinkham”. 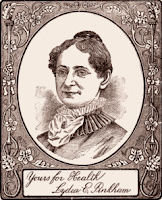 Lydia Estes Pinkham (American, February 9, 1819 – May 17, 1883) was an iconic concocter and shrewd marketer of a commercially successful herbal-alcoholic "women's tonic" meant to relieve menstrual and menopausal pains. Like many women of her time Lydia Pinkham brewed home remedies, which she continually collected. Her remedy for "female complaints" became very popular among her neighbours to whom she gave it away. In Lydia Pinkham's time and place the reputation of the medical profession was low. Medical fees were too expensive for most Americans to afford except in emergencies, in which case the remedies were more likely to kill than cure. For example a common "medicine" was calomel, in fact not a medicine but a deadly mercurial toxin, and this fact was even at the time sufficiently well known among the sceptical to be the subject of a popular comic song. In these circumstances there is no mystery why many preferred to trust unlicensed "root and herb" practitioners, and to trust women prepared to share their domestic remedies such as Lydia Pinkham. It is reputed to have been her son Daniel who came up with the idea, in 1875 of making a family business of the remedy. Lydia initially made the remedy on her stove before its success enabled production to be transferred to a factory, she answered letters from customers and probably wrote most of the advertising copy. Mass marketed from 1876 on, Lydia E. Pinkham's Vegetable Compound became one of the best known patent medicines of the 19th century. Descendants of this product are still available today. Lydia's skill was in marketing her product directly to women and her company continued her shrewd marketing tactics after her death. Her own face was on the label and her company was particularly keen on the use of testimonials from grateful women. Although Pinkham's motives were partly self-serving, many modern-day feminists admire her for distributing information on menstruation and the "facts of life," and consider her to be a crusader for women's health issues in a day when women were poorly served by the medical establishment. In 1922, Lydia's daughter Aroline Chase Pinkham Gove founded the Lydia E. Pinkham Memorial Clinic in Salem, Massachusetts. The clinic, still in operation as of 2004, provides health services to young mothers and their children. It is designated Site 9 of the Salem Women's Heritage Trail. What Was In The Original Vegetable Compound? * Unicorn root (Aletris farinosa L.) 8 oz. * Life root (Senecio aureus L.) 6 oz. * Black cohosh (Cimicifuga racemosa (L.) Nutt.) 6 oz. * Pleurisy root (Asclepias tuberosa L.) 6 oz. * Fenugreek seed (Trigonella foenum-graecum L.) 12 oz. How Did Lydia Pinkham’s Vegetable Compound Become A Song? One of the reasons given for why this women’s tonic became a part of drinking ballads and an increasing success in the twenties and early thirties was its availability as a 40 –proof patent eye-opener, during Prohibition. Some also suggest that it might have been a music hall song (vaudeville) which might have gone on to become a children’s rhyme or the other way round. How The Scaffold got involved is information I don’t have available to me, maybe if they read this article they could leave a message? Suffice to say, if it was originally a drinking song, maybe alcohol was involved to some degree! What Happened To The Scaffold? After an appearance in a children's TV series (Score With The Scaffold), TV campaigns, a half hour musical movie called ‘Plod’, the trio re-united for their final tour to promote their album 'Sold Out' and then disbanded for good. Where Can I Find A Copy Of 'Lily The Pink'? Your best bet is probably second hand record shops and 60’s party compilations. My parents still have a pretty scratchy 7” version and it has a jar of brightly coloured sweets on the front cover. I will take a photo and upload it to this article when I have been home next. Although Lydia Pinkham was not after all “Saviour Of The Human Race”, she has unknowingly provided us all with a fantastic song which should not be lost to time and format change. Lovely post! Puts a new twist on being in the pink. I remember this song, so thanks for such a well researched piece. Thanks! I've always wondered the song was about, I'm fascinated by the origins of folk songs. Hope your toe is getting better.